LUSH.BOUNTIFUL. Vintage Red Enamaled butterefly pendant Necklace is STUNNING!! & beautiful which make any one LURED to Purchase it on the spot. This Necklace Set with red multistranded wax chord & the Red enameled Butterfly Pendant at the end made of Antique brass metal is the ULTIMATE Jewelry. The Butterfly body is beautifully decorated with Siam rhinestones embedded that sparkle & shine which is so EXOTIC!! adds all dash of chic elegace & charms to beauty to ONE who wore them. 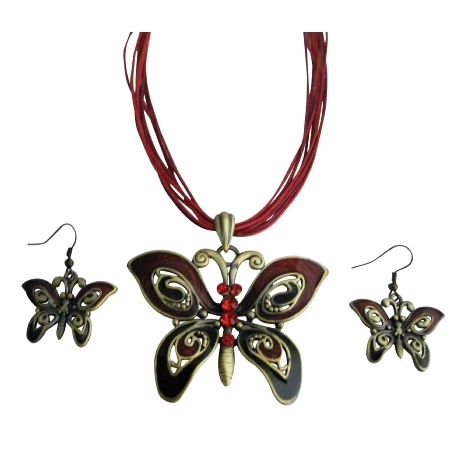 The ELIXIR of one of the most beautiful butterfly wings are hand painted in Red with the matching Earrings too. DAZZLING! no Match. ALL party wear!! Festive mood jewelry!! spender & CLASSY quintessence of world's top most Ethnic imitation Jewelry ornaments! !.only provided by us.Giving you that apex ROYAL & making you for the people to say the Only GORGEOUS ONE! !.Simply UNRESISTANT.